There are no photos with those IDs or post 12333 does not have any attached images! 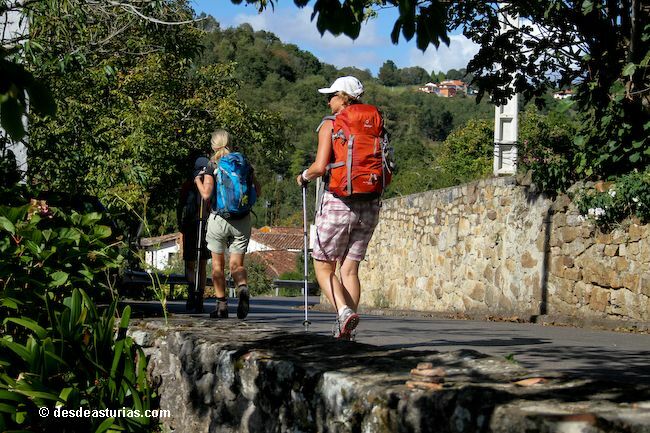 There is no doubt that the Camino de Santiago is one of the tourist-cultural initiatives that has experienced the greatest growth in recent years in the north of Spain. Despite the fact that today the most common path is the French, which cover the 72% of users, it is true that other alternative routes are developing a substantial increase. Therefore, from the tourism service of the Commonwealth of Cider it has been considered opportune to open a line of work that allows to promote the stay in the accommodations near the Jacobean Route, which passes through the municipalities of Colunga, Villaviciosa and Sariego. In this way, the project was created "Pass of the pilgrim in the Comarca de la Sidra". In the Comarca de la Sidra they want all the pilgrims to Santiago to have the best of breaks. Therefore, they propose that they enjoy their accommodations with a very special proposal for them. This initiative is based on a offer of accommodation + welcome detail -related to the cider theme of the destination "Comarca de la Sidra", as the invitation to a bottle of cider or an apple candy, among others- for just 20 € * per person. Also, if the accommodation is more than 500 meters from the road, they will pick up the pilgrims and take them the next day to your starting point. Today more than twenty tourism companies, belonging to both the traditional hotel industry and rural tourism, which have joined the initiative in the region, becoming one of the territories of Asturias that has a greater volume of offer for this type of customers. · Minimum 2 people to hire the service. · Necessary credential presentation of the pilgrim. · Promotion subject to availability.